Overview: Dracula is dead! Love live Dracula! Welcome back to The Tomb of Dracula, the legendary run by Marv Wolfman, Gene Colan and Tom Palmer. Having worked on the title for more than a year, the creative team have found their stride with the title, putting together some of the best stories in the run of the series. Picking up where things left off in the last collection, Dracula is believed to be dead, which leads his pursuers to go their separate ways. Taj returns tot India, where we discover that his wife is crippled and his own son is a vampire. Frank travels to Brazil, where he encounters zombies and the mysterious Brother Voodoo. Meanwhile, Dracula realizes that this powers are waning, and must track down the reason for his condition. Following the clues, he travels across to Europe, taking on assignments to move him forward in his weakened condition. Eventually, the clues point him to America and Dr. Sun, who apparently did not die in their last battle seen in Volume 1. Dracula crosses the Atlantic to America, where he sets up his operations in Boston. There, he meets a new ally in Harold H. Harold, a would-be writer of vampire tales. Harold hopes to leverage his friendship as a source for new stories. Dracula revives long enough to confront Dr. Sun, only to be killed by a henchman. As can be expected, there is no quiet way for a vampire to travel, and eventually Quincy Harker and his team are back on Dracula’s trail, following him to America. Realizing how strong Dr. Sun has become, the vampire hunters conclude that the enemy of my enemy is my friend, and bring Dracula back to life to help them in their battle. Dr. Sun is eventually defeated and Dracula regains his powers. Following a meeting between Dracula and Doctor Strange, the vampire turns his attention to establishing a base of power in America. He joins up with the Church of the Damned in Boston. He meets Domini, a beautiful woman who has given herself over to the church, and decides to take her as his new bride. Dracula plans on siring a new child, with the goal of taking over the church to expand his reach. Unfortunately, the church has plans to use the offspring to take down Dracula once and for all. What makes this Essential? : Wolfman, Colan and Palmer reach their peak with this collection. The stories and art are more solid than the previous and next volumes. Dracula finally feels like a threat, yet he remains a character you want to see succeed in his actions. I like setting the stories in America, as it gives the entire team a more comfortable environment in which to tell the stories. Footnotes: Doctor Strange #14 and Tomb of Dracula #44 and #45 are also reprinted in Essential Doctor Strange Vol. 3. 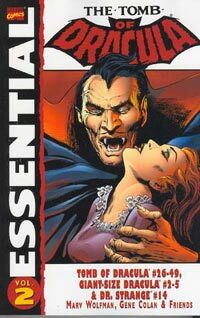 Several issues in this Essential make reference to the events in Dracula Lives, a black-and-white magazine that ran for 13 issues. Those magazines are collected in Essential Tomb of Dracula Vol. 4. If you like this volume, try: the Doctor Strange vs. Dracula trade paperback from 2006. Yes, it does reprint the crossover already collected in this Essential, but it also includes a five-part story from Doctor Strange #58 to #62 from 1983. In this story arc by Roger Stern and Dan Green, the two title characters are searching for the Darkhold, a book with untold secrets. One of those secrets can bring an end to all vampires on Earth. Dracula and Doctor Strange go back-and-forth in their quest to claim the book, which also brings in Blade and the Avengers. Overview: Here we go, readers! It’s the final adventures of the original X-Men as members of Xavier’s School for Gifted Youngsters. Cyclops, Marvel Girl, Angel, Beast, Iceman, Havok, and now Polaris go on a non-stop run of adventures that take them from the sands of Egypt to the jungles of the Savage Land to the bright lights of the Las Vegas strip. The highlight of this collection is the Roy Thomas and Neal Adams all-to-brief run on the title. Adams had been doing work for DC for about two years when he came over to do some work at Marvel. (At that time, creators generally worked for just one company at a time. If someone did work for more than one publisher, one of their jobs would be done under a pseudonym.) At the time that he came onboard with X-Men #56, the book was floundering in the sales column. Adams came in and helped plot a wild adventure ride, introducing new threats to the mutants. While this is the most creative peak in the title’s seven-year run, it could not stop the cancellation ax. The final issue with original content was X-Men #66. Beginning with issue #67, the title ran reprints of old X-Men stories. Let this sink in for a minute. There was a time when X-Men was strictly a reprint book. It was more profitable for Marvel to re-run old stories versus commissioning new stories. Unbelievable! Now, the title may have been in reprint mode, but the characters still existed and became free game to use in other books. So Iceman makes an appearance in Amazing Spider-Man, and Havok & Polaris show up in the pages of the Incredible Hulk. The volume concludes with the solo adventures of Hank McCoy, who finally graduated Xavier’s school and landed a job in a Brand Corporation research lab. McCoy works on isolating the chemical cause of mutation into a liquid solution. Trying to keep his work from falling into the hands of corporate spies, McCoy swallows the formula, and his body is mutated into a furry gray Beast. (In later issues, the fur would change permanently to blue, but that’s not important for this black & white collection.) The Beast finds that he is trapped in this further-mutated body. Despite attempts to hide his mutation, Hank finally embraces his blue-furred identity. These stories are written by Steve Englehart, and he would continue the Beast’s story in the pages of The Avengers. What makes this Essential? : In my humble opinion, this really is an essential volume to own. First, the Thomas-Adams run on this title is the first “great” story-arc in the history of the X-Men. The Sentinels are more menacing, the Savage Land is more savage, and the introduction of Sunfire opens the door for the international approach to the X-Men in the mid-1970s. In addition, by collecting the X-Men adventures in the other Marvel titles of the 1970s, it highlights how a proper Essential should be put together. The books should be reprinting the character stories, and not necessarily just within a specific title. The solo adventures of the Beast would never have been reprinted in any other Essential volume, so including them here was perfect. While some of the characters’ appearances can be found in other Essentials (see Footnotes), having these stories in one book reads so much better for the X-Men fan. Footnotes: Amazing Spider-Man #92 is also reprinted in Essential Spider-Man Vol. 5. Incredible Hulk #150 and #161 are also reprinted in Essential Hulk Vol. 4. Marvel Team-Up #4 is also reprinted in Essential Marvel Team-Up Vol. 1. Amazing Adventures #17 reprinted the origin of the Beast, originally told in backup stories from X-Men #49 to #53 (see Essential Classic X-Men Vol. 2). The cover to issue #17 and new framing pages are included in this Essential. X-Men #67 to #93 and X-Men Annual #1 & #2 reprinted classic X-Men stories from the 1960s. New covers were created for those issues, and the covers are included in this Essential. If you like this volume, try: the X-Men: Hidden Years series by John Byrne from 1999 to 2001. 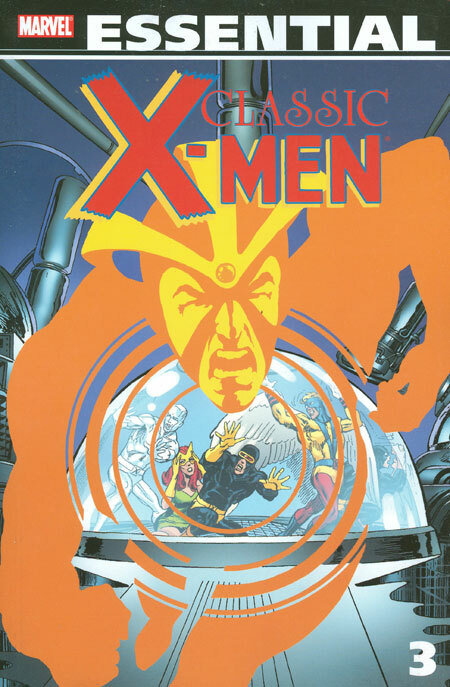 This series was designed to pick up the story of the original team following X-Men #66, the last original issue of the series. Byrne begins his story with what should be issue #67, but numbered as #1, and continues the adventures. Over the next two years, Byrne told new stories set in the Marvel Universe of the early 1970s, so the mutants encounter a Fantastic Four with Crystal subbing for Invisible Girl. We meet a young Ororo before she has her official first appearance as Storm in Giant-Size X-Men #1. The problem with this book is that it was written and drawn by John Byrne. Not that he necessarily did a bad job with either, but more that Byrne became a very polarizing figure in comics by the early 2000s. A new leadership team took over the reigns as Marvel’s Editor-in-Chief and opted to cancel the book as the X-Men universe was too convoluted and needed to be streamlined. (Note that streamlining of the X-Men books lasted for about one month.) You can read into that the cancellation was due more to personality conflicts between Byrne and management, and not due to poor sales, poor stories, or a convoluted X-Men universe. This entire series was collected in two trade paperbacks in 2012, so it should be relatively easy to track down. If you are a Byrne fan, by all means check this series out.